Accolades will soon pour in from quarters that are fully satisfied with the role played by Navi Pillay in facilitating their agendas. It showcases how UN has been turned into a peace body flooded by puppets and agents of the West who are being used to legally redraw governance of sovereign nations and through UN legislation, remove the governing power held by sovereign nations. Third World, China, Russia and perhaps now India need to realize the gameplan and resolve to address this ground reality. Navi Pillay’s role on behalf of the West has been unprecedented creating precedents outside of the mandate afforded to her. These precedents have been created primarily as a result of sovereign nations sending incompetent representatives not passionate enough to defend their country’s integrity and sovereignty. It is not difficult to benchmark in whose interest the UNHRC has been used during the six years Navi Pillay has held office. The UN Human Rights Council created by UN General Assembly resolution 60/251 on 15th March 2006 succeeded the UN Commission on Human Rights established in 1946. The position of UN High Commissioners has existed since December 1993. Navi Pillay took over from another disgraced UN High Commissioner Louise Arbor on 1st September 2008. To add meat to the credentials of Navi Pillay, her function must be exemplary, unbiased and transparent. These were all lacking in her performance not just against Sri Lanka but all the non-Western nations she helped put down. A good look at all statements and actions by Navi Pillay and her office since 2008 will show no actions taken against US, UK or NATO countries. Is it not strange that from the time Navi Pillay took over as UN Human Rights Chief she has not made a single call to investigate US, UK or NATO for their crimes in Afghanistan, Iraq while she called for not only investigation but intervention upon Libya and Syria? Can she then argue that she has honorably carried out her duties? It will be these countries that would soon shower praises and accolades at the wonderful work she has done and of course they can afford to do so, Navi Pillay has facilitated their agendas to perfection. Navi Pillay abused office to demonize Gaddafi and son to lay groundwork to facilitate calls for an international intervention. Navi Pillay stands accused of turning a nation without debt, a nation that had $150billion reserves to a nation in anarchy. Navi Pillay used lies of NGO Bouchiguir to suspend Libya from UNHRC so that Libya would not be able to reply to the charges made against it. This meeting which she chaired, she called for the international community to ‘act without delay’ to protect Libyan civilians. After the US-mercenaries created anarchy in Libya she has failed to make any calls to ‘protect Libyan civilians’. Navi Pillay prevented Libya from appointing a new ambassador to the UN and Libya had to use Rev. Miguel D’Escoto Brockman (former Nicaraguan Foreign Minister) but was blocked by US Susan Rice showing how UN and officials have shamed their roles. Navi Pillay without basis referred Libya to the UN Security Council and called ICC to lead an international investigation against Gaddafi and son. Navi Pillay’s lies include quoting casualty figures without verifying truth – She claimed that 250 people had been killed in Libya going on to say “widespread and systematic attacks against the civilian population” which “may amount to crimes against humanity.” – these were all lies prepared for the intervention by US and NATO. Navi Pillay is morally responsible for destroying Libya. Navi Pillay / the US or Allies have NOTHING to show that Libya is better in ANY WAY after Gaddafi to how the country was under Gaddafi. Rwanda’s civil war was in reality a stage managed conflict as part of US conglomerate foreign policy of gaining strategic and economic advantage in Africa (not for Americans but for the handful of corporate that run America). Navi Pillay is accused of being party to the agenda of the West as she carried out role of President of the International Criminal Tribunal for Rwanda. Lawyer Justry Patrice Lumumba Nyaberi objected to Navi Pillay as President of ICTR in view of her bias. Navi Pillay and Stephen Rapp prosccutor at ICTR were accused of covering US culpability. When people congregate and commit money to fund ‘rebels and supply equipment’ there has to be a catch. The plan against Syria was set in early 2011 through ‘Friends of Syria’ initiated by Canada and represented by 70 countries with US committing to provide ‘communications equipment’, Saudi and Qatar pledging large sums o money for regime change and Canada committing $8.5m. Fast forward and when Navi Pillay issues statements on violations of human rights, calls for international intervention, Syria to be referred to the ICC we should all know what was in store for Syria. That plan made sure President Assad who was repelling mercenaries funded by the West was faulted and accused of crimes against humanity and an arrest warrant was issued turning Assad into an international fugitive. Navi Pillay took side of Western-backed rebels most of whom were non-Syrian nationals outsourced from other countries. She chose not to take the side of the legitimate Syrian Government trying to protect the country from rebels using lethal arms supplied by Western Governments. US have admitted sending lethal aid to Syrian rebels. Navi Pillay’s role in Syria regime change alleges her guilt in violating Article 1 and 2 of the UN Charter that says regime change within a sovereign country is a war crime and no one can threaten regime change. Why has Navi Pillay not accused Al Qaeda / Al Nusra and Takfiris arriving from 40 states facilitated by Qatar and Turkey? Why has Navi Pillay not condemned Qatar for spending $3billion for the war in Syria? Why does Navi Pillay not allow sovereign Syria the right to protect its country and its people especially when Syrian people have given overwhelming thumbs up for Assad? The accusation that Navi Pillay functioned as an agent of the West was seen in predicting massacres to take place in Al Oseir 20 days before the events started. When Navi Pillay does not have a mandate to refer countries to ICC why was she allowed to function outside her mandate just like she is functioning outside her mandate on Sri Lanka? Sri Lanka’s issues with Navi Pillay. Nemo iudex in causa sua implies no one should be a judge in their own cause. A principle of natural justice is that a person should not judge a case in which they have an interest as it would undermine confidence in the process as well as impair the individual’s ability to perform duties and responsibilities. Not only must Justice be done; Justice must be seen to be done. Thus the recusal of judges (required by law under Continental civil law systems and by the Rome Statute, organic law of the International Criminal Court) is imperative for true impartial justice and Navi Pillay should have chosen to judicially disqualify herself from taking part in affairs related to Sri Lanka. Navi Pillay’s Indian Tamil community in South Africa was said to be aligned with LTTE, funding LTTE and secretly operating military camps to train LTTE – these camps were dismantled by President Mandela after consultations with former Foreign Minister Lakshman Kadiragamar. Her February 2014 report calls for an international investigation against Sri Lanka but she has never called for international investigations against military interventions by US and Allies. The pattern of her behavior is not the same. She can listen with empathy to spouses of dead LTTE leaders but she has no time to travel to other parts of Sri Lanka where LTTE struck terror for 30 years. Her calls for international investigations echoes similar calls against Libya and Syria at the behest of US and NATO and questions the framework that UNHRC is planning for Sri Lanka using the false reports likely to be compiled. Navi Pillay is accused of procedural bias for not circulating Sri Lanka’s response to her incriminating report. There are many Uncle Toms and Aunt Sally’s amongst us. Their backgrounds and living styles are such that they cannot connect to the heritage of the country they have been born into to feel pride or passion to defend their nation. They feel they belong to other foreign cultures and will do whatever to feel belonged to that culture. These people will immediately take offence for accusations made against Navi Pillay because they belong to the same category which is why they would argue in favor of Navi Pillay by explaining why she demanded investigations against Libya and Syria but did not do the same for Iraq and Afghanistan against the US & NATO? Supporters of Navi Pillay must also explain why she lost sleep about 300,000 IDPs immediately following the end of conflict (all of whom are now out of refugee camps 5 years after the end of conflict) while she remains mum on 12MILLION people living as refugees for over 10 years? Her supporters may also like to answer why she has not taken a single action to investigate international mercenaries who are being used by Western governments to destabilize nations. Her supporters need to also explain why she has not taken action against the West for using and supplying banned chemicals including white phosphorus and sarin gas which these governments have openly admitted. Her supporters may like to also let us know why she does not investigate NGOs and other religious institutes who are foot soldiers for Western regime change and why she has not made any statement on unethical conversions which are an issue for Asia including India. Her supporters need to also tell us why she has not initiate investigations or made calls for such on terrorists who function under charities and NGOs abusing tax-free status to transfer money across the world. Anyone defending Navi Pillay must supply reasons to showcase why the issues mentioned have not been included into the action plan of Navi Pillay during her 6 year term. When Canadian anti-war activist Ken Stone accuses Pillay of abusing her power to facilitate western intervention and regime change it sums up the argument quite aptly. The cases referred above are cause for alarm because no one expected Syria to face this calamity but now Syria is in a mess, no one expected a debtless Libya to have its leader publicly killed. No other thought that internal conflicts could be created inside nations to form the grounds for foreign presence/intervention – that’s what happened to Rwanda. Faked documentaries and films are media inducements to fool international public- Syria and Libya are victims and Sri Lanka too. No one thought Kosovo or South Sudan could happen but they did and these are all precedents. Sri Lanka’s international investigation is also a precedent. It is the FIRST time a country is being investigated for a concluded conflict but that investigation covers just 1/3 of the entire conflict. The officer chosen by Navi Pillay had been expelled by the Somali and South Sudan governments for doctoring reports so we can imagine how Sri Lanka’s report will be compiled when they have already declared that they have already compiled necessary details. Sri Lanka’s leaders need to seriously wonder what is the urgency, time and effort behind 3 Resolutions and a UNHRC investigation and it has to be far more than simply regime change. We need to realize that the puppets are preparing to legitimatize a grievance and from that build up a legal argument for creating a separate state in Sri Lanka (for the moment it will take the form of Eelam but in reality it is not an Eelam for Tamils, at least not for the Hindus). It is good for India to start relooking at the entire scenario. If it could happen to Syria, Kosovo, South Sudan, Libya, Rwanda and Sri Lanka it could happen to any other country so countries should not be lukewarm in their response. There is a serious flouting of international laws by public officials of the UN and Navi Pillay is just one of them. Navi Pillay has not done anything for the Non-Western World to be proud of. These letters should goes to UN sec.gen and request for an inquiry. Anyone pushing on it. That’s the best thing to be done before she goes on pension. UN sec gen does not have any different reputation. They are all obedient monkeys of the evils US and UK. 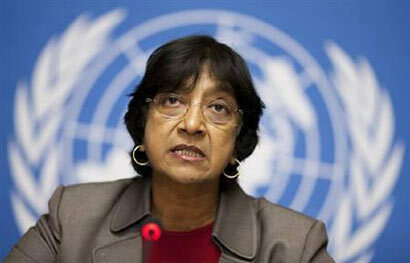 Navi Pillay leaves the UNHRC with a poor record of world-wide plunder under the guise of upholding human rights. Whe she gets back to South Africa following retirement, she should be locked up in Robben Island. I praise Shenali Waduge’s investigative journalism. Shenali appears to surfing the web, long hours, day in day out, presenting unprecedented evidence against the injustice perpetrated by the western world.